Conformity Assessment Bodies that provide Certification, Testing, Inspection and Calibration services such as Certification Bodies, Inspection Bodies, Testing & Calibration Laboratories, Medical Laboratories etc. and Related Educational Services providers. The accreditation assessment process deployed by QABCB shall accommodate the organizations of all sizes and carrying out wide range of activities. 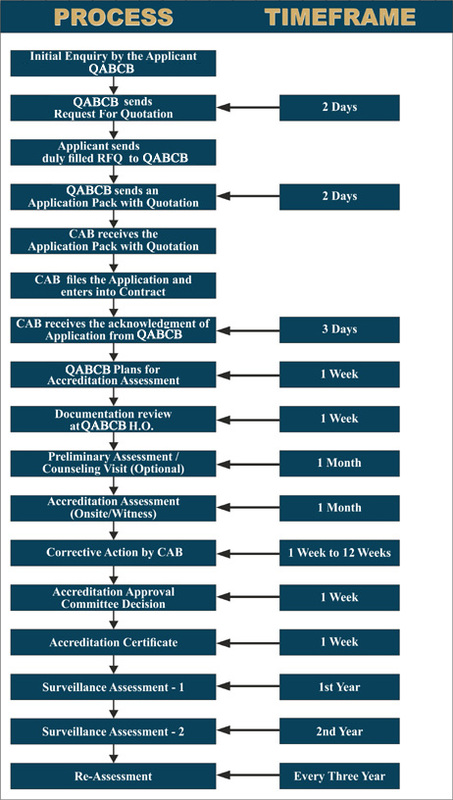 QABCB accreditation services are accessible to all applicants whose requests for accreditation fall within the activities and the limitations as defined within QABCB's polices and rules. Similarly, organizations accredited by QABCB do not have any geographic restrictions and can offer their QABCB accredited services internationally. The accreditation process starts with the filing of the duly completed application for accreditation and is followed by an adequacy assessment and onsite assessment. The process is concluded with the decision on accreditation. The post accreditation process commences thereafter. The applicant should read and understand QABCB's Accreditation Scheme Manual especially the Requirements for Granting and Maintaining Accreditation and the Current Fee Structure before submitting the application in the prescribed format. Please refer QABCB Manuals & Documents posted on the website www.qabcb.com or please get in touch with the QABCB secretariat. The process chart given below is for indicative purpose only. It is expected that the applicant organizations have a specific & assured plan of action for obtaining the QABCB accreditation and nominate a senior & accountable person to co-ordinate all activities related to the accreditation process. QABCB accreditation is granted to organizations who have demonstrated that they fully meet the requirements of relevant national and international standards. Details of applicable standards can be obtained from ISO or National Standardization Body. QABCB does not provide consultancy, advisory or internal audit services for obtaining QABCB accreditation nor does it has any policy to recommend or approve any consultant involved in such activities. Please refer Schedule of Fees under relevant Application Pack posted on the website www.qabcb.com or get in touch with the QABCB secretariat.